Anyone who has seen a picture of the Seattle skyline will be familiar with Seattle's internationally recognised symbol, the futuristic Space Needle building. From afar it looks like a spinning top, with the needle pointing skywards. 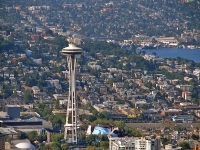 The Space Needle was built for the 1962 World's Fair to showcase upcoming architectural development, and proved itself by withstanding an earthquake in February 2001 measuring 7.6 on the Richter scale. It has since been declared a historic landmark by the City's Landmarks Preservation Board. Visitors can get to the top of the Space Needle using one of the elevators that travel at ten miles an hour, reaching the observation deck within 43 seconds. On windy days, however, the elevators are slowed down to 5 miles an hour for safety reasons. Visitors can ascend the 607-foot (185m) building as far as a revolving observation deck 520 feet (158m) above the city, where high-powered telescopes are positioned to allow you to pick out the city sights. There is a revolving restaurant on top of the tower that allows visitors to take in every part of the panoramic views while enjoying a meal. Admission: $26 adults, $17 children 5-12, other concessions available.